Two of Kerr County's courthouses in a single photo. the taller building is Kerr County's third courthouse, completed in 1886. There have been either four or five courthouses in Kerr County. 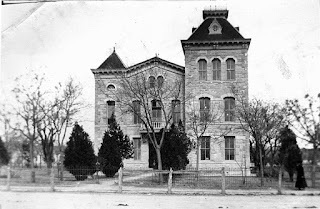 The very first Kerr County courthouse was made of logs and stood opposite Jefferson Street from the courthouse square, about where the parking lot of Grimes Funeral Chapels is today, and was ordered by the very first session of the newly-formed Kerr County commissioners court. The very first session of the Kerr County Commissioners Court was not held in Kerrville, but at Commissioner George M. Ridley's farm opposite Center Point, either in Mr. Ridley's home or in a brush arbor on his place. The first problem for the new court was to provide a place for the new county to conduct its business. On May 20, 1856 the commissioners accepted land from Joshua D. Brown, a site located in Survey No. 116. According to that morning's proceedings, the commissioners directed the Brown "shall make a good and satisfactory warrantee deed to said county to at least four acres of land for a public square, all the streets that may be laid out in the town plat, said streets leading out from the public square to be eighty feet wide and the cross streets to be sixty feet wide; one choice good lt fronting on the public square for county use, one lot in suitable place for public church, one lot in suitable place for public school house, one lot in suitable place for jail." 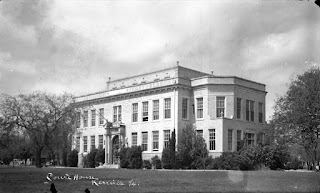 In the same meeting, the commissioners also authorized a contract for the first courthouse, ordering "that there be a contract made by the County Court for the building of a temporary Court House in Kerrville, to be built as follows: Of logs sixteen feet long, skelped down and to be eight feet high, the cracks to be boarded up, sawed rafters and good shingle roof with gable ends well done up, good batten door strongly hung and corners sawed down." That same afternoon they accepted a bid from Wm. D. Hendrix, one of the commissioners, to build the temporary courthouse for $100.00, and stipulated the structure be completed by August 11th. From specifying the particulars of the first courthouse to the completion of the building would take 83 days; the building was accepted by the court on August 18, 1856. There are no known photographs of that first courthouse, though the second courthouse and the third courthouse can be seen in several photographs. In March, 1860, by a vote of 78 to 21, some Kerr County voters chose to move the county offices to Comfort. While there, the commissioners voted to build a new courthouse on five acres of land given to the county for a public square. I'm not sure if that courthouse was ever built. When Kendall County was created, in 1862, Comfort found itself just over the county line, and out of Kerr County, so the county seat came back to Kerrville. County business was held in several buildings until 1875, when Kerr County finally built a more permanent courthouse on the courthouse square. This second courthouse was built by Hamer & Faltin, the only bidder the project, for $4,460. It was to be made of stone and have a single story. However, a petition "from a majority of the taxpayers of the county" was presented to the court asking for a second story, to be used for community events, which raised the price by $2,000. This courthouse was accepted by the commissioners court in August, 1876. 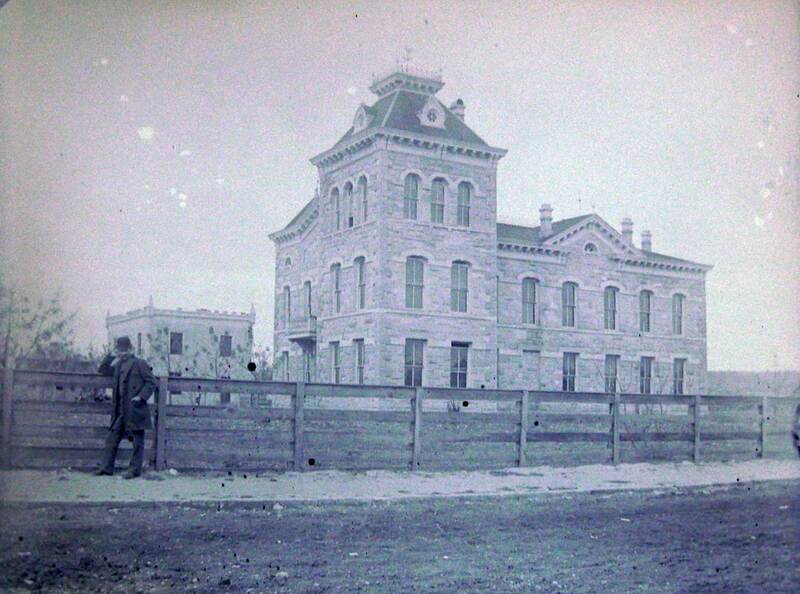 The next courthouse was built in 1885, and the older 1876 stone courthouse was recycled, becoming the Kerr County jail. The 1885 courthouse was attractive, and I have several good photographs of the building. Most of the building was two stories, but it also had a three-story tower. The building faced Main Street, and was not in the center of the courthouse square. Both the 1876 and 1885 courthouse were closer to Main Street, with a lot of room behind them on the square. This courthouse was completed in 1886 at a cost of $19,545. A total of $25,000 in bonds were sold by the county for the project; $3,000 of which went for the jail "cages," and $500 for the court house furniture. $100 was paid to Mrs. Jane Brown, widow of Kerrville founder Joshua Brown, for the stone from her quarry, to be used in the construction of the courthouse. In November 1925 the commissioners court decided it was time to build a new courthouse. They put the matter to a vote of the citizens. 953 votes were cast, and, by a majority of 227 votes, the county proceeded in January 1926 to issue $110,000 in bonds for the construction of the courthouse. The new courthouse was designed by Adams & Adams, architects out of San Antonio. W. C. Thrailkill, of San Antonio, won contract to build the courthouse. This courthouse was completed in early 1927, and is still in use today, though an annex built in the 1970s greatly enlarged the building. Joe Herring Jr. is a Kerrville native who needs to get started on his Christmas shopping. This column originally appeared in the Kerrville Daily Times December 1, 2018.